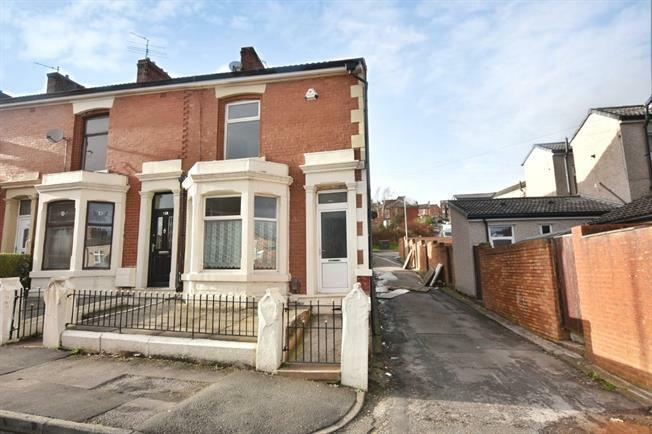 3 Bedroom End of Terrace House For Sale in Blackburn for Asking Price £95,000. Public Notice - 126 Downham Street. We are acting in the sale of the above property and have received an offer of 95,000. Any interested parties must submit any higher offers in writing to the selling agent before an exchange of contracts takes place. This large terrace property is offered with no chain and comprises an entrance hallway, two reception rooms and a kitchen at the rear. Upstairs there are three bedrooms, a family bathroom and the further benefit of an attic room with Velux windows. The property has gas central heating and double glazing throughout, rear yard and a large purpose build shed. Double glazed uPVC bay window facing the front. Radiator and gas fire, carpeted flooring, built-in storage cupboards, ceiling light. Double glazed uPVC window facing the rear. Radiator and electric fire, laminate flooring, under stair storage, ceiling light. Wooden back door opening onto the yard. Double glazed uPVC window facing the rear. Tiled flooring, ceiling light. Roll edge work surface, built-in wall and base units, stainless steel sink, freestanding oven, over hob extractor, space for washing machine and fridge/freezer. Double bedroom; double glazed uPVC window facing the front. Radiator, carpeted flooring, under stair storage, ceiling light. Double glazed uPVC window facing the rear. Laminate flooring, ceiling light. Radiator, vinyl flooring, ceiling light. Low level WC, corner bath, shower over bath, pedestal sink.